Djuma – a month on! One of the baby impala for the open area! Young elephant we saw today on drive! I have no news to tell you all as yet about me, but hope to have in the next week or 2. I am at Djuma for a visit and thought everyone might appreciate hearing about the love of our lives while I was here, so without further ado here we go! One of the zebra herds on the open area this morning! I could swear I saw Teddy run off as I drove in to camp on the 13th after a long 6 hours on the road. It was small enough and dark enough for it to have been, although I was quite exhausted and it is possible I could have miss identified our short furry friend. Sadly he/she didn’t come back out to say Hi, but I had a huge smile on my face as I felt I had just been welcomed home by Djuma! Although I didn’t realize what a welcome back I was about to have, in more ways than one! (Just a note on the side, if ever you leave a fridge for a while, you might want to make sure the door is wedged open!) After a major clean up operation and a much needed sleep, it was time to go and see who would come out to say happy new year! Water monitor from this morning’s drive. Jacco hadn’t been out on a drive in a while, so he came with me to check out the hyena den on Zoe’s road, but as I expected, nobody was home and it looked like it had been a while since there had been anyone there. I did wonder if the den off Phillamon’s cutline was in use again instead and after Jacco told me the cubs were seen often by the bush braai site on the open area, I thought it was worth investigating. Hyena adult from yesterday afternoon. I am so glad we did! As we pulled in we noticed one of the adult hyenas lying in a tunnel entrance! She kept looking over shoulder into the tunnel, which gave the impression there were cubs behind her, so we sat for a while and waited hoping to see which cubs were there. Sadly there was no sign of the little terrors, but we did receive a radio call about Karula not too far away at Tree house dam as we were heading to the den earlier. We wanted to delay our approach to allow the other vehicles with guests to see her first and have time with her. As we realized we would not have luck with the hyenas anytime soon, another call came to tell us her daughter, Xivindzi was on Weaver’s nest road close to the junction of Gowrie main. Our lady of Djuma, Karula. Her mother was evidently calling, but it is hard to say if Xivindzi could hear her, as she was taking her merry sweet time about responding if she had. She may have just been waiting around for Karula’s return, looking for her own dinner and it was just by chance she was heading in the right direction towards her mother! With the rain that Djuma has had, the vegetation has expanded 10 fold and unfortunately Xivindzi was quite happy to sit and be just out of sight of my camera! When she did eventual move, the greenery swallowed her up as quickly as a rain drop dissolves and becomes part of the sea. Luckily by this time there was space for us to join our lady and we did so, just north of Tree house dam, as she continued to call her wayward children, which came to no avail except for the appearance of a hyena, possibly the one we had seen a bit earlier. No doubt she heard Karula’s calls and came to inquire if there was a free meal on offer! Karula keeping a very close watch on the hyena! You can imagine the queen of Djuma was none too happy about the uninvited guest, but the spotted cousin kept a respectful distance and eventually comprehended there was nothing to be had and left. Karula gave up her own search for the time being and took a load off atop a termite mound! Some of you might remember the day she called the boys for hours with no answer from them. The calls she gave for Xivindzi and Xivambalana were not as loud and she didn’t seem too concerned at having no response from them. With the cubs being around 14 months old, they are more than likely still relying on her for food and it could be she stopped so they wouldn’t come to find her while the hyena was in the vicinity. Floppy ears cubs are on the left and Teddy is standing! With the setting of the sun, we returned to the hyena den to find, who I think were floppy ear’s youngsters curled up together and Teddy; full of energy as always! Sadly wrong lens for the light, but it was too light for the spot light to work, but at least you can see them! Teddy would be around 5-6months old now and has the spotted coat like that of the older hyena, but it is still quite dark and is more fluffy than even floppy ears 2! Teddy seeing something more exciting in the bush! Teddy caught our scent and looked like s/he wanted to come over, but seemed a bit intimidated by the vehicle. It is hard to say if there was some recognition or just general interest, but s/he took a few steps closer each time while sniffing the air and when I spoke s/he did venture closer still. Evidently though something else more important came up that needed urgent attention and Teddy’s focus was drawn away from us! We left the young clan members as they scurried off into bush in answer to an adult calling and with night drawing in, it was time to check on Karula and her daughter again. Karula on the right and Xivindzi on the left. A lap around Tree house dam brought nothing, but as we approached elephant skull and weaver’s nest junction for a final lap of the dam who should stroll out in front of us? The ladies of Djuma, Karula and Xivindzi! They gave us a royal walk by right next to the vehicle and continued down weaver’s nest towards Gowrie Main! Xivindzi seems to be a typical teenager, leading the way and showing she is all grown up, but every so often needing her mother’s attention! It was a perrrfect end to a wonderful day! The 2 ladies strolling down the road, Karula on the right her daughter on the left. This morning I joined Texan and Lotts of drive and for the first time I saw the Manyeleti boundary, more of Buffleshoek property and the first rock at torchwood! It was great to see the places we have heard mentioned so often on the radio! the male giraffe with a patch missing on his neck, showing us his sense of humor so early in the morning! There has been a return of a crocodile at Twin dams…I thought you might like to know about that! The wildebeest herd has had young, I saw 3 but there could be more! This little one can’t be more than 2 months old! The baby impala look to be doing well and are in enjoying the protection of the large creches! I even had a buffalo bull blocking my path on the way down to the lodge this morning! This last picture is of the weaver birds who were making the nests at tree house dam. If you remember there was only a couple of males who were busy when we left with very few nests that had been built, as you can see it is no longer the case! The sound was deafening! I hope you enjoy hearing about the residents. 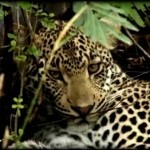 If I head out again or if I have any news of the residents of Djuma or about what I am doing I will be blogging! Exclusive African luxury – now more accessible. 33 Responses to Djuma- 1 month on! Really great to hear you’re back there and will enjoy your blogs keeping us up to date. So good to hear from you. Talk in the chat room at Pete’s pond says your driving at D.J.? Looking fioward to future letters. Wonderful to hear from you Tara! Thank you for such an interesting update on the animals around Djuma. Your pictures are wonderful to see! Hope your plans work out well! Looking forward to your next post! Tara! How great to FINALLY hear some news from Djuma! I wonder often about Karula and the young ones. Thank God you made it back to shed some light. Lovely photos, and much appreciated. Enjoy your stay. thank u so much Tara for the update. I have missed the drives so much and I am so excited that u r back and enjoying ur time there. Great to hear from you Tara and about Djuma. I was a loyal lurker for the safaris. I’m the dentist in San Diego (Friend of Gregg who got Mark his Snowy River hat. BTW, I got one for myself also). Glad to hear that everything is well with you. Any news on your two other partners? Glad to hear you are back Tara, and enjoyed your updates and news, especially re the hyena cubs. We last visited in November – Hope to be back soon in March. our beloved Teddy, Karula and Xivindzi as well as our other favorites. Thanks for sharing your pictures with us. The update is quite welcomed, and it was nice to see that you are back at Djuma for a period of time. So glad your back. We all needed to hear from you. The fact that it came from Djuma was icing on the cake. We all miss the drives so much, as I am sure you do. Thank you Tara for everything..
We are hoping everything with you Marc and Seb is going great. 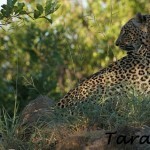 Tara so glad to hear from you and at Djuma, made my day! Thank you for sharing the beautiful pictures with us. Miss you all so much, take care. It is really great to hear about Teddy, Karula and her little princess and all the others. I wish you the best, Tara. How wonderful to be caught up a little, but how sad to be reminded of what we are missing. Life just isnt the same without experienceing the drives. Thank you Tara for being so thoughtful.. I know that everyone misses you and the rest of the “pony tail gang”. Happy & Healthy New Year’s wishes to Everyone a Djuma! So glad to hear from you and get caught up on the latest news. I’ve watched the archives several times already, so fresh news is really appreciated. Hope you are doing well. Can’t wait to hear what you are doing. What a lovely surprise to hear of your visit! I am so glad that your blog has been sent out from the Djuma e-mails, or else I would have missed this wildlife diary entirely. I am glad you are well, Tara! Thank you so much for the wonderful report. I am looking forward to more. Tara – It is soooo wonderful to hear from you. Your narratives and pictures are just awesome!! We have missed you, Marc, Seb and our extended families at djuma so much! Your pictures and updates on all our djuma friends mean so much to us!! You will continue to be in my thoughts and prayers and hopefully we can join you again (SOON) on safari! Tara, it is so lovely to here from you at Djuma. Your photos are wonderful and it simply awesome to see Karula, Xivindzi, Teddy et al again. Tara, thanks for the pictures and updates. It is real good to see all those residents again. We ‘ve missed them! And the safari! Pictures are wonderful! Life has not been the same without the drives! Please keep us posted. Great to here about our family. Thanks so much Tara for the info. It’s great to hear from you. Miss you guys everyday..Good luck to you. Keep up the info. We Love You Guys…. Thank you Tara for the update on our family at Djuma, the photos says it all great photos, so glad you are back with us although really you have not left us just had a holiday for a few weeks, you have been greatly missed too, anyway your next adventure lots of luck please keep in touch, if you see Marc please give our man my kind regards thank you Tara. I was delighted to see your post when I turned on the computer this morning! Thank you for taking the time to do this and giving us the pictures of our favorite animals. Watching the waterhole cam is nice but can’t compare to being on drive with you. all the fond memories of the safaris that we miss so much with you, Marc and Seb. It’s so good to see our djuma families and hope that you can continue to keep in touch. Tara, I was soooo pleased to get your email….what can I say that everyone here hasn’t already said…it is very sad with so many changes…just keeping my fingers crossed that things get worked out so we can all go on those fantastic drives again….I just hope all our favorite animals don’t forget that funny thing that keeps following them around morning and evening!!! LOL…take care and looking forward to your next email. Welcome back Tara. I so enjoyed catching up with news of our special animals. My how Teddy has grown. Fabulous photos. What a pleasant surprise to find your email in my inbox! I loved reading the update on all of Dejuma’s residents that we all know and love. You write in such a personal way that makes us all feel like family. The pictures are fabulous and if I had to pick a favorite, it would have to be the male raffie. What a shot! I shall call him Patch. 🙂 I look forward to future writings Tara and I hope my post finds you, Marc and Seb all happy and healthy! Thanks again for the update Tara, it’s always great to hear from you. Welcome back Tara! So great to get updates. Seems like forever since we heard a word about Karula’s family. Have there been sightings of the little boy? Not so little anymore I suppose. Thank you again it means a lot. Thankyou so much for all the incredible pictures and your updates. How wonderful to receive all of it. Thankyou again…..stay safe.